The first twenty-three years of my life I have counted as wasted, without God and without hope in this world. I joined the United States Navy in January, 1971. I was to find out how far downward I could go. These were to be the latter years of our nation's conflict in Vietnam. Briefly, time will tell the matter. With time the fruit will come and will show itself, whether it be good or bad. We see a divinely set pattern here, even supernatural, with the number seven. The “just man” has seven times more the perseverance of “the wicked” … a factor of seven to one advantage. AM = [Anno Mundi] Years of the world from creation. 21st B.B. = 21st Century Bible Believer - Dates by Richard St.James – 34 year offset from Ussher from the creation to Abraham is synchronized to the Seder Olam Rabbah Temple dedication date. In the first millenium, [the Creation Week on the fourth day] is when the sun appeared. [0 AM] [3970 BC]. 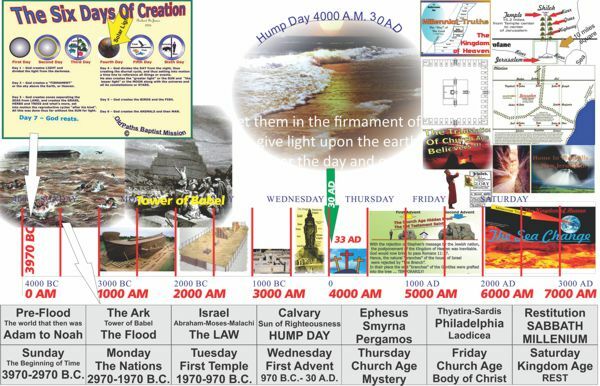 In the fourth millenium, HUMP day is when “the sun of righteousness” publicly appeared [4000 AM] [30 AD]. This “Kingdom of Heaven” is “the latter days” which are a subset of “the last time”. The pattern formed is this: God will turn again to Israel after the translation of the body of Christ occurs [which event is described in both First Corinthians chapter fifteen and in First Thessalonians chapter four, which see]. At the close of the Kingdom of Heaven on this earth, which is at the close of the seventh millenium of time, the clock will “stop”. Time will fold up and be no more, for we will all go into eternity forevermore. The End of Time is coming!